pretty much i have not blogged in like a year. I havent really been able to run lots of miles cuz my piriformis was so tight it was pinching my nerve that runs down your leg and if i moved it would shoot pain down my leg and i couldnlt feel my feet if i sat for a long time or if i ran more that 2 miles. So ive been hovering around 2ish miles for the last couple weeks and doing pool workouts (ew). Ive found the cause though and ive been doing stretches to help it. My right hip is like an inch higher than the other one. Anyways, the last two days i have felt pretty darn good and have been building up mileage again! For some reason today i was so excited to run. Like more than any other time in my entire life. I dont quite know what the deal was but i was jumping up and down waiting to run. I am so excited to get back into it. Honestly, since i moved here, i haven't had much drive to run. It was harder, i didnt know anyone and it just wasnt Pine View. But all of a sudden all the puzzle pieces seem to fit together. I love cedar, i love running, and i love SUU. Im so hungry to do some great things. I ran 3.5 miles with alison today! pretty much the best three miles of my entire life. I love running. its the greatest thing of life. it felt lovely today and im excited for tomorrow so i can run some more. ALSO SHOUT OUT TO JACEY FOR SIGNING TO RUN AT SUU TODAY!!! I HONESTLY CANT EVEN WAIT!!! 4 Miles today! Slowly but surely I’ll get back. Patience isn’t key and I have none, but I can do it! 4.5 miles in st. george with Sam and Max. It was a good time. We ran over by suicidal tendencies and barrrel roll, but we didnt do either of them. It would have connected though if we went further im pretty sure. It felt real good to run in st. george again. Also it was real fun to stay at the condo with sam and max. Me and Sam and Max drove to confluence park today and ran there. It was a good time. We did the mayors loop and it felt swell. 4 miles with Sam. I had heart burn a little and so that was wierd. We averaged 7:15 pace and it felt reallllly realllly good. The weather was also perfect becuase i could wear a sweatshirt but i didnt need to wear pants. We ran at night and it was a little scary. well, so i went to watch ellie and scoottie run the dream mile, and ended up just ruunning a few of my miles with them as they cooled down. It was really good to see everyone again. I miss everyone, especially roberts. After, I decided to finish my miles and for some reason thought that it wasnt that far to my house, but it was farther than i thought (apparently cedar distance is stuck in my head cuz you can run the distance of cedar in like 6 miles lol) I ended up going 6.5, but i only wanted to go 5. Oh well, i felt really amazing, so im not sad i went the extra miles. Averaged 7:08 minute pace for the 5 miles that i ran by myself. Definitely on the climb!!! I am so excited to do some great things. For track im gonna bump up the miles. 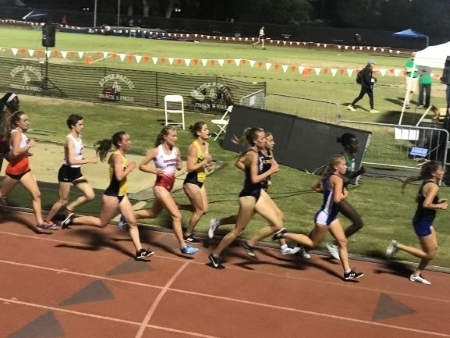 Im now used to the paces of the college way, and i know that more miles works for me, so im gonna try to get up to being able to rotate 8,9,10 for the track season. 3.70 miles with mi Madre. Nice and slow and a very good run. We just ran around the hood on the dark. I started to go by myself but running in the night alone scares the living daylights out of me so I made my mom come with me after I ran around the block once. Swell run with mi padre. We ran on the road to warner valley. It was a good time. I miss running with him. I felt pretty darn good. I did some rebecca pacheco rrecovery yoga afterwards and it was lovely. I went 3 miles today. I am currently sick and felt like grabage so i kept it real short. I woke up and my throat hurt really bad, so i didnt run in the morning. We went and got our christmas tree up on cedar mountain, and most of the time i just stood there. Thank the heavens it hasnt snowed yet, cuz that would have been awful. Anyways, after we got our tree (which is a beaut by the way), i took a couple hour nap and woke up and felt even worse, so i laid around and watched friends. Then i finally got up and decided to go at least a couple miles. Scottie rode his bike with me. I averaged about a 7:20, which isn't awful. First day of practice as a recommitted runner. We just had a 50% run today. It felt like it wasnt practice tho cuz i had to run by myself. Coach put me in the B group and everyone went like 4 miles except me and kamryn but she didnt run with me. We have 4 days of speed this week and i hopefully can prove myself enough to get back into the A group. It was freaking cold by the end and dark. and it started snowing for a minute. Not gonna lie, im glad it didnt snow for 4 hours like it was supposed to. AM- I got up and ran 1.5 miles. i felt kinda tired, but i wanted to go on a shakeout beofore our workout today. I did some good rolling out and some abs as well. Im glad i went, cuz i feel much better. PM- I got to run with the other group today cuz coach combined us. We did an 80 with hills. Aka the workout I struggle the most with, but I'll get there. I'm glad it was today rather than later this week. I started strong with the group on the 3 laps but started to fall off alot on the way to home Depot. It was decent though I can't complain about it especially since it's the 2nd workout of the week and only the second workout that I've done in a long time and I'm sick. Overall it was decent! The hills were good and hard. My belly kept jiggling on the down hill lol. Ellie and Dylan came to cedar to eat with me at sushi burrito. It was delicious. Holy canolies. Last night i tried to go to bed early cuz I felt like garbage and I was just drained. Anyways, got in bed and laid there for 2 hours and never fell asleep so watched the Grinch With Sam Max and Josh. Quality movie. I went to the physical therapist today in St George this morning, so no mornjng mileage. He is a good guy and I really liked him. It's the same one addi goes to and she likes him alot.